Something's eating my mint plants! My boyfriend has some mint in a makeshift garden box on the ground on his driveway. It's just infront of a brick wall, so there's mint, and then a climbing plant going up the wall. 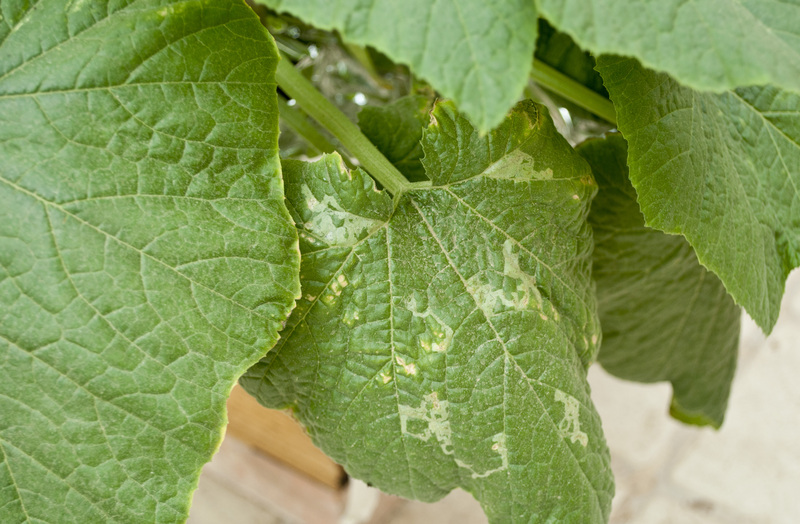 The mint is being eaten from the inside of the leaf, and the climber is starting to show similar bite marks. We haven't seen anything but spiders around, and we haven't caught them on the plant at all. The other one is neon pansies on a raised garden bed about a metre off the ground - Stu (boyfriend) did catch a caterpillar red handed over there. sidenote: how do I add an automatic signature to my posts? I can't find it anywhere! Re: Something's eating my plants! At the top of the page, right side you will see something that says Bethkay12 profile, next to view your posts. Click on where it says profile and it will take you to a control page. The control page has a horizontal menu that says overview, profile, board preferences, etc. When the page opens up it is set on overview. Click on the profile tab/button. That page has a vertical menu that says edit profile, edit signature, edit avatar, etc. Click on edit signature and type in what you want. Be sure to save. It is actually easier to do than to describe here. If so, that is a leaf miner. It is not the worst pest you can have, because the plant can withstand a good bit of that without being harmed much. But you don't want to let it turn in to a major infestation. Just pull off and destroy (not compost) any leaves with marks on them. The leaf miner is the larva of some little fly or moth. When it has eaten enough of the leaf tissue to grow full sized, it will chew its way out of the leaf and drop down into the soil below. It will burrow a little into the soil, pupate, and come out as a new adult. If you keep the soil covered, with weed barrier or thick mulch so the larva can't get to the soil, it will interrupt the life cycle and help prevent the next generation. My mint plants are stripped of all leaves and only stems are left. I grew up with birds snails and grasshoppers but I've never seen anything devour entire leaves. I have one blue jay and a squirrel so I assume its the blue jay? Never had one but quite ready to try. Last but not least I have house centapedes I have noticed in my soil? Much smaller than the few I've come across in the "house". I'm quite sure they can't eat all the leaves off a plant either. I doubt the blue jay or squirrel is the culprit. Maybe more than one thing. Near the bottom there are leaves with oval holes out of the middle. That looks like slug damage. A lot of the other leaves remaining are eaten from the edge in scalloped bite marks. That looks like some kind of caterpillar/ worm damage. It could be cutworms, because they are famous for stripping things. I would try coming out late at night with a flashlight and check thoroughly to see what you find. Re: Something's eating my mint plants! Agree! Also check for sawfly larvae on the underside of the leaves. I've had them eating my Peppermint leaves last spring. They tend to jump off if disturbed so sometimes laying something flat -- cloth, plastic sheet, underneath and just running your hands over the stems - loosely grab stems and pull the leaves through your hand -- will reveal them as they drop down on the surface. It's always the herbs that get eaten first. I started planting them from hanging plants because the only thing that wouldn't get eaten by insects were chives. That's very odd! Most aromatic herbs are considered insect repellent and are planted in garden beds to help keep insects away. I grow a lot of herbs and insects never bother them. Occasionally slugs (which are not insects) will chew on them, but even the slugs don't bother them as much as other plants. Slugs and snails can climb fences and trees. Baskets are a good idea, but you may still have to move them when the snails find them. Who is eating my Hummingbird Mint, and what can I do!? What's the difference between these 2 mint plants?